Home » Estella Heights apartment » Tien Phuoc and Keppel Land, sustainable cooperation in real estate market! Tien Phuoc and Keppel Land, sustainable cooperation in real estate market! Empire City is the Vietnam’s highest tower of 86 floors (Vinhomes Landmark 81 has 81 floors), has a total investment of $ 1.2 billion and is just one of many big projects that Tien Phuoc developer conducts. Earlier, we wrote about the wealth of multinational corporations GAW Capital Partners owning and managing real estate worldwide assets. Tien Phuoc is the local partner of this corporation. Tien Phuoc is known as real estate developers with large projects, but the most of alls cooperate with Keppel Land-a leading real estate group of Singapore, and such projects usually known as Keppel Land projects brand. Even the project Empire City, there is also as cooperation between Tien Phuoc and Keppel Land to develop construction. In 2012, the project have been approved by HCMC People’s Committee for Tien Phuoc -Keppel Land as developers. It is built on Lot 2B land in Thu Thiem urban area – a combination of commercial centers, offices, apartments, hotels, … especially 86-floor observation tower. At the moment, Keppel Land has now withdrawn from this project. Tien Phuoc was founded in 1992 by Mr. Nguyen Thanh Lap. He was born in 1950 in HCM City – currently the Chairman of JSC Tien Phuoc, also the Chairman of Management Board Nam Rach Ltd. (a joint venture between Thai Tran – Tien Phuoc -Keppel Land). All companies are investing in many large real estate projects in HCM City. Projects of Tien Phuoc are often placed in Districts 1, 2, 5, 9, 12 and Binh Chanh district, nearby Binh Duong, Binh Phuoc, Ba Ria – Vung Tau, Khanh Hoa provinces. After 23 years of development, the company now has a chartered capital of 860 billions Dong. Empire City is just one of many projects that the giant real estate company has invested in self-building or cooperate with foreign partners. In particular, especially the period 2010-2011, this was also the period Tien Phuoc have plenty signings with Keppel Land. The first large project of Tien Phuoc in HCMC is Phu Binh Khanh resettlement. Phu Binh Khanh was built in 2009, by Nam Rach Ltd. as an investor, with the scale of 1,844 apartments on a 3,6 hectares land area. On June 2011, there were 512 first apartments handed over, in 2012 with additional 620 apartments. 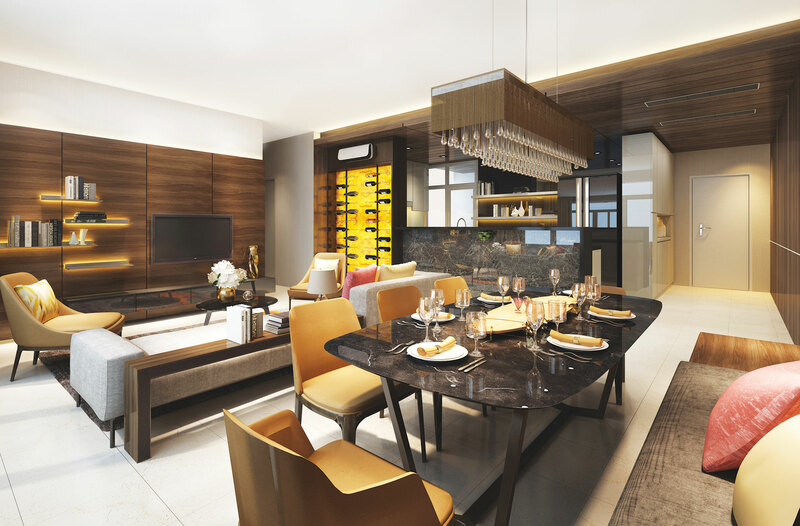 However most well-known one is The luxury project named Estella and the luxury villas along Saigon River. The Estella 1393 apartments placed in District 2, which has completed progress 1 and ongoing investment in progress 2 (Estella Heights) on an area of 2,54 hectares , including 496 apartments with 33 floors tower, priced from 36 million Dong per square meter ($1.800), scheduled to complete in 2017. Tien Phuoc and Keppel Land is currently under cooperation in many high-end real estate projects such as Nam Rach Chiec 30 hectares, by Nam Rach Ltd. as an investor. The total project investment is 38 millions USD, of which 42% Keppel Land, 38% of Tien Phuoc and 20% Tran Thai. The complex project among the river is expected to create a new community with 4,700 apartments. By late 2010, Tien Phuoc and Keppel Land has continuously signed many cooperation contracts to build villas along the Saigon River. Including that is 225 villa apartments in District 9 which has total investment of 115 millions USD. Tien Phuoc invest 50% and Keppel Land 50%. Besides, these 2 great companies has another cooperation to complete a riverside villa of 11 hectares with 175 units. Besides the cooperation project with Keppel Land, Tien Phuoc has also implemented some specific projects such as Long Truong in District 9 with 43 villas and the Greenfield Village with 18 apartments. Empire City project is an ambitious project of Tien Phuoc. According to the representative of Empire City, the company will arrange financing with best interest from foreign financial institutions and use of Vietnamese human resources is key to developing and operating the project.